It was February 18, 1964. 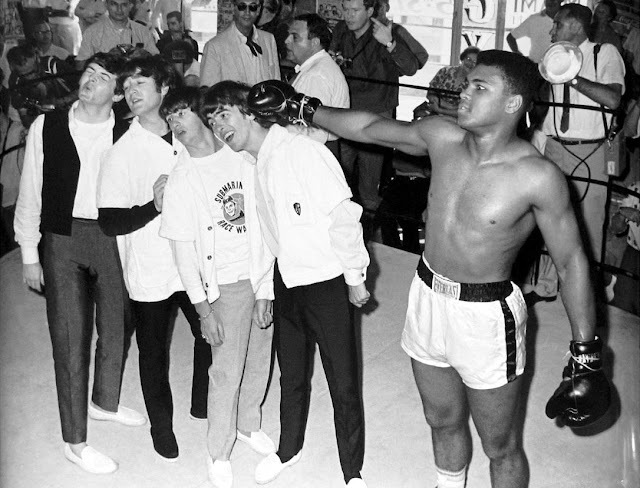 The Beatles had arrived in America just 11 days earlier and had taken the nation by storm. They already had the number one record on the charts and several others quickly catching up. They had appeared on the Ed Sullivan show before 73 million awestruck and curious fans. It was the highest rated television broadcast in history up to that point. They had partied briefly in the Big Apple, done a quick concert in Washington D.C. and two more special concerts at the legendary Carnegie Hall. 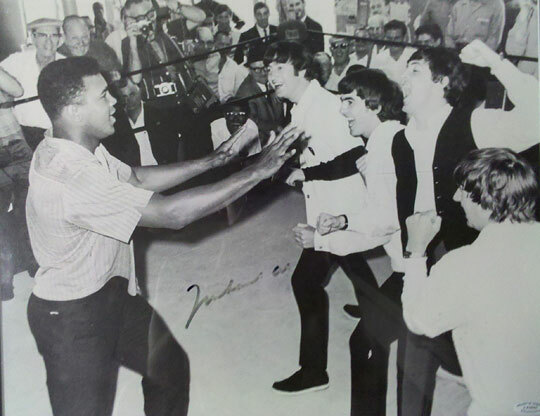 Interestingly, Liston was in the crowd watching their second Ed Sullivan appearance on Feb. 16th. Nevertheless, he was not exactly a “fan” calling them “sissies” and saying, “My dog can play drums better than that guy”- referring to Ringo. 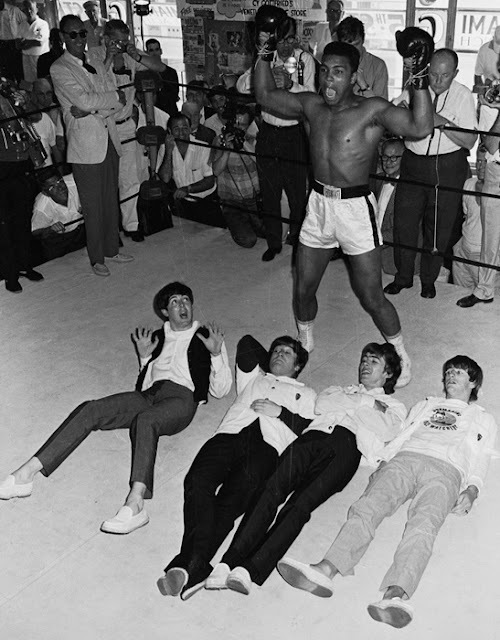 And so it was, the Beatles had to settle for “second best” and meet Liston’s challenger for the title, a brash 22-year-old named Cassius Clay. Clay and Liston were scheduled to meet for the heavyweight championship in a week on Feb. 25th. But soon, the general tone changed and it was clear who the real “star” of the show was. 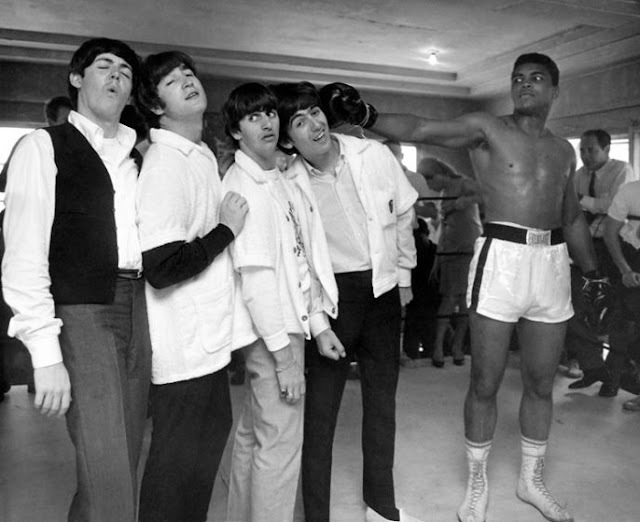 The Fab Four and Clay posed for several photo ops, during which Clay brusquely ordering them around. The Beatles obeyed and seemed to take it all in good humor. It got slightly uncomfortable when Clay barked “Squirm, you worms!” to the surprised quartet. Finally, as the boys were getting ready to leave, Clay picked up Ringo and tossed him up in the air a bit, then caught him. 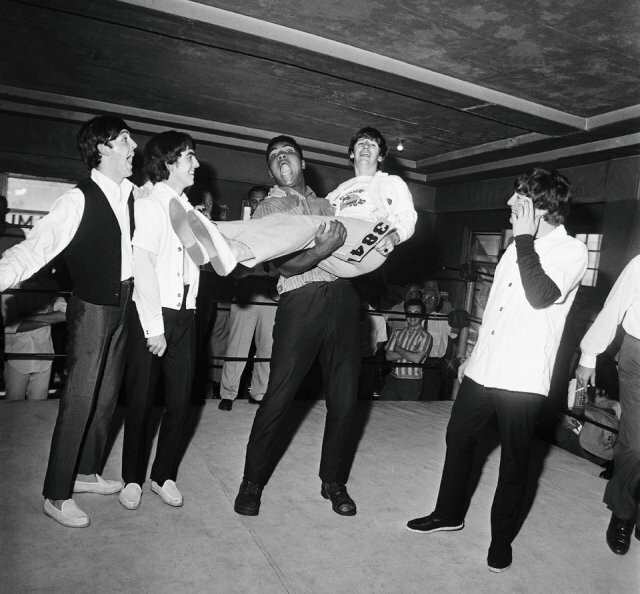 Clay then wished Ringo and the others good luck. All seemed well and routine on the surface, but it wasn’t quite so perfect below it. 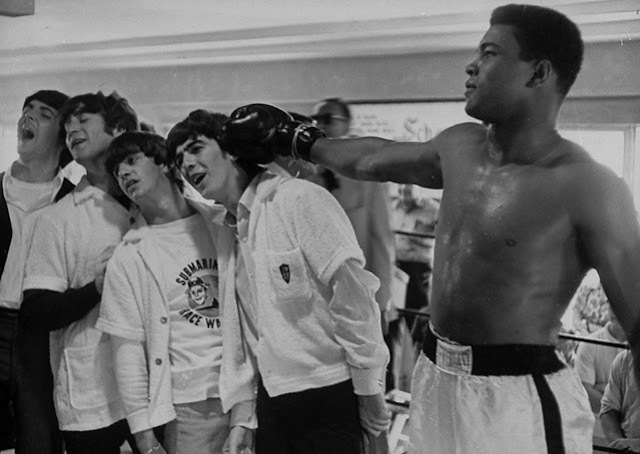 Needless to say, the Beatles were so mad about the session with Clay that they didn’t speak to Benson for several days. 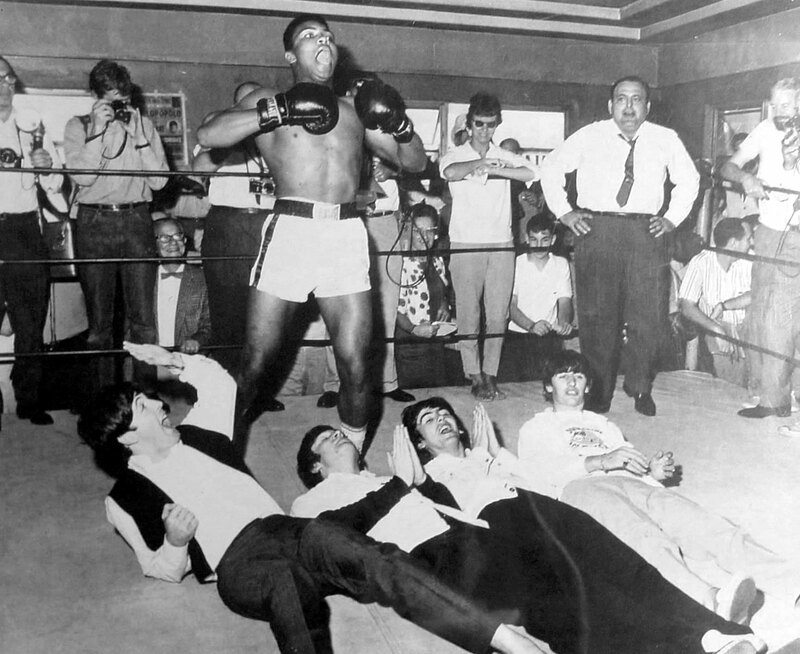 As Lennon later stated, “He [Clay] made a fool out of us!” But as one looks at the old black-and-white newsreel and photos of the legendary encounter, one sees nothing but big beaming smiles all around. The event was quickly over and the Fab Four soon moved on the conquer the entire world with their incredible, brilliant music and wit. Clay, a 7 to 1 underdog, was to knock out Sonny Liston (in 7 rounds, not 3) and become the most famous boxer of all-time. 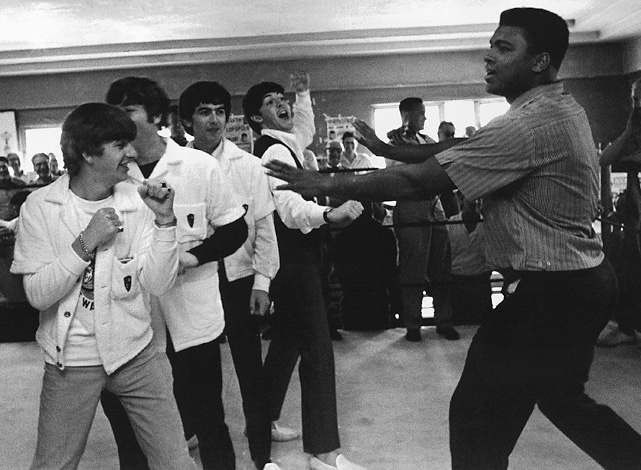 Both Ali and John Lennon were to later have a profound impact on the Anti-Vietnam war movement. Ironically, both, by the late sixties, were also to be cast by millions as “villains,” after originally being known as lovable, harmless guys. “No, but you are!”, Lennon snapped back.